Pictured above are the three styles of 2-way key fobs (transmitters) available for the 2-Way Advanced Remote Start system. The particular style of transmitter that came with your system was chosen to match your vehicle's features and controls. Not all buttons listed below may be available on your particular transmitter. Remote-Start: Used to start the engine (See Remote Vehicle Start). Lock: Press this button to lock all the doors. Unlock: Press this button to unlock the driver s door. If the button is pressed again within three seconds all remaining doors will unlock. Trunk/Lift glass/Power Lift gate: Press and hold this button for about one second to release the trunk lid (if equipped), release the lift glass (if equipped) or to open and close the power lift gate (if equipped). Power Liftgate: Press and hold this button for about one second to open and close the power liftgate (if equipped). Vehicle Locator / Panic Alarm: Press and hold this button (if equipped) or simultaneously press and hold the Right and Left Side buttons for abouc one second to locate your vehicle. Press and hold this button or simultaneously press and hold the Right and Left Side buttons for more than two seconds to activate the panic alarm. Press this button or simultaneously press the Right and Left Side buttons to turn off the panic alarm. Radio Next Function (if equipped) -Allows you to go to the next radio station stored as a favorite or the next track or chapter when a CO/OVD is playing. This feature can be used when tailgating (requires radio to be on). Vehicle Odometer -Allows you to check the vehicle's odometer reading (accurate within 1 mile). Audible Feedback/Silent Mode -Allows you to mute the transmitter's audible feedback. Fuel Gauge -Allows you to check your vehicle's fuel level. Tire Pressure (if equipped with tire pressure monitoring system (TPMS)) allows you to check the tire pressure of all four tires. You can scroll through the available features/functions by pressing the Right Side button. A box surrounds the active feature. Each button press will move the box to the right, highlighting the next feature. Left Side Button: This button has three tactile bumps on it and is used to control the above Enhanced Function Menu features. This button can also be used to turn on the display back lighting (press once). If the button is pressed twice within one second, the transmitter will enter 2nd Vehicle Mode (the numeral "2" will be displayed). The following is a brief definition of the icons available on the 2-Way Advanced Remote Start transmitter display. Transmit/Receive Icon -Appears animated when the transmitter is attempting to communicate with the vehicle. The Vehicle Frame icon showing all door segments filled in confirms that the vehicle received a lock command. The Vehicle Frame icon showing the lower left segment open, confirms that the vehicle received a driver's door unlock command. The Vehicle Frame icon showing all door segments open confirms that the vehicle received an unlock all doors command. Lock With Security Icon -Confirms that the vehicle received a lock command with the ignition off. The vehicle's content theft-deterrent alarm is arming/ armed. Unlock Icon -Confirms that the vehicle received an unlock command. Remote Start Icon -Confirms that the vehicle received a remote start command. Vehicle Locator/Panic Alarm Icon -Confirms that the vehicle received a locator/panic alarm command. Trunk/Power Lift gate Icon -Confirms that the vehicle received a trunk lid release or a power lift gate open/ close command. Lift glass Icon -Confirms that the vehicle received a lift glass release command. 2nd Vehicle Icon -Appears when the transmitter is in 2nd Vehicle Mode. Numeric Display -Shows current time (if equipped), remote start countdown timer, vehicle's odometer reading (accurate within 1 mile) or vehicle's tire pressure readings. Enhanced Function Menu Icons -Displays all available Enhanced Function Menu features (Radio, Odometer, Audible Feedback/Silent Mode, Fuel Gage, and Tire Pressure). Box surrounds tile active feature. Fuel Level Icon -Indicates the vehicle's fuel level. Audible Feedback/Silent Mode Icon -Indicates whether audible feedback is on or muted. Check the distance. You may be too far from your vehicle. You may need to stand closer during rainy or snowy weather. Check the location. Other vehicles or objects may be blocking the signal. Take a few steps to the left or right. Check the position of the transmitter. You may need to hold the transmitter higher or at a different angle. Holding the transmitter with the antenna pointing upward is the optimal position. This system includes an antenna which has been installed in your vehicle. Depending on your vehicle, this antenna may or may not be visible. The antenna's location in your vehicle is critical to achieving the extended operating range. Relocating the antenna will affect system performance, Adding window tint, body moldings kits, and tool boxes. etc. can negatively affect the operating range if they block the transmitter's signal to the vehicle's antenna. Due to the vehicle structure, the transmitting range of the 2-Way transmitter may be greater than the transmitting range of the vehicle. The vehicle may perform a requested command, but the transmitter may not receive the response. Functionality of the 2-way Advanced Remote Start system is simple; it transmits the function you request to the vehicle and then receives confirmation or information from the vehicle to complete your request. The features and controls have been divided into three basic groups -standard, secondary and enhanced. Standard features are Lock, Unlock and Remote Start. Secondary features are Trunk Lid Release, Lift glass Open, Power Lift gate Open/Close and Vehicle Locator/Panic Alarm. Enhanced features are those included in the Enhanced Function Menu and 2nd Vehicle Mode. The display screen will become active when any button on the 2-Way transmitter is pressed. The main display will show the Vehicle Frame icon (with or without door segments depending on last command confirmed), current time (if equipped), Audible Feedback / Silent Mode icon and the icon for the last command confirmed (Lock with Security icon is shown) Depending on the function you are trying to perform, you may also see the Transmit/Receive icon. 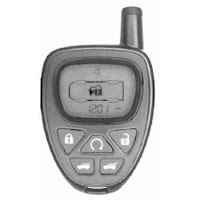 Although the 2-Way Advanced Remote Start system has enhanced range capabilities, occasionally the vehicle may not receive the command from the transmitter or the transmitter may not receive the response signal from the vehicle. The transmitter has a Response Not Received feature to alert you that the cycle was not completed. Transmitter is out of range of the Vehicle. 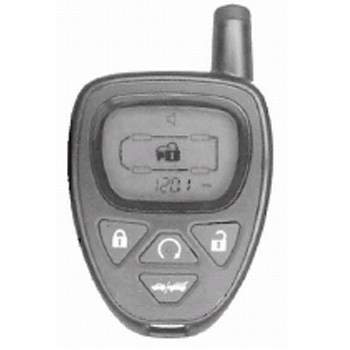 The vehicle may perform the function, but the transmitter may not receive confirmation. When the command and response cycle is not complete, the display alternates between security lock and car frame. The transmitter will beep four (4) times to alert you of the response not received. These beeps will be audible regardless whether the transmitter is in Audible Feedback or Silent Mode. LOCK: Press the Lock button to lock all the doors. Once the response is received, the display will show the Lock icon in the center, the Vehicle Frame icon will show all door segments filled-in and the transmitter will beep once. The transmitter will beep the number of times described here only if Audible Feedback is on, not if it is in Silent Mode. LOCKWITH SECURITY (if equipped): Press the Lock button with the ignition off to lock all doors and to arm the vehicle's content theft-deterrent alarm system. Once the response is received, the display will show the Lock with Security icon in the center, the Vehicle Frame icon will show all door segments filled-in and the transmitter will beep once. UNLOCK (driver's door only): Press the Unlock button to unlock the driver's door and disarm the content theft-deterrent alarm system (if equipped). Once the response is received, the display will show the Unlock icon in the center, the Vehicle Frame icon will show the driver's door segment missing; i.e. driver's door unlocked, and the transmitter will beep twice. UNLOCK (all doors): Press the Unlock button twice within three seconds to unlock all doors and disarm the content theft-deterrent alarm system (if equipped). Once the response is received, the display will show the Unlock icon in the center, the Vehicle Frame will show all door segments missing to represent all doors unlocked and the transmitter will beep twice each time the Unlock button is pushed. Laws in some communities may restrict the use of remote starters For example, some laws may require a person using remote start to have the vehicle in view when doing so. Check local regulations for any requirements on remote starting of vehicles. Press and release the lock button and then press and hold the Remote Start button for more than 2 seconds to start the vehicle. Once the response is received, the display will show the Remote Start icon. The transmitter will beep once to confirm the remote start command was received. Once the vehicle is started, a response is sent to the transmitter, activating a countdown timer. If the engine doesn't start successfully, or the response is not received, the timer will flash a series of dashes, the Remote Start icon will disappear, and the transmitter will beep three times. To check if the vehicle started without the response being received, press the lock button when closer to the vehicle. Once the response is received, although the timer will not be displayed, the Remote Start icon will be displayed to show the vehicle is started. If you start the vehicle with the ignition key before the timer expires, the display will come on, the timer will flash a series of dashes, and the transmitter will beep twice. If the countdown timer reaches 20 seconds, the display will come on, and the transmitter will beep once. To manu811y shut off a remote start, press the Remote Start button. 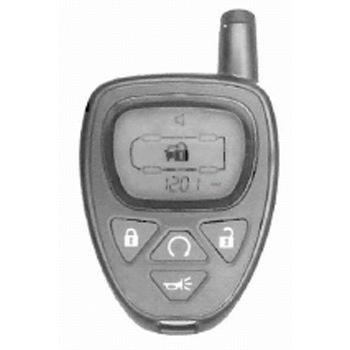 Once the response is received, the timer will flash a series of dashes, the Remote Start icon will disappear and the transmitter will beep once. The time that the transmitter displays will automatically synchronize within a couple of minutes to the vehicle's clock during normal transmitter operation, however there may be times at which the time on the transmitter and the time in the vehicle will be different (i.e. after transmitter battery replacement and when daylight savings time begins or ends). To manually synchronize the transmitter's clock to your vehicle's clock, turn on the vehicle's ignition, turn on the vehicle's clock, and press a face button on the transmitter. To locate your vehicle, simultaneously press and hold the Right and Left Side buttons or press and hold the Vehicle Locator/Panic Alarm button, if equipped, for about one second. Once the response is received, the Vehicle Locator,/Panic Alarm icon will illuminate for three seconds and the transmitter will beep once. To activate the Panic Alarm, simultaneously press and hold the Right and Left Side buttons, or press and hold the Vehicle Locator / Panic Alarm button, if equipped for more than two seconds. 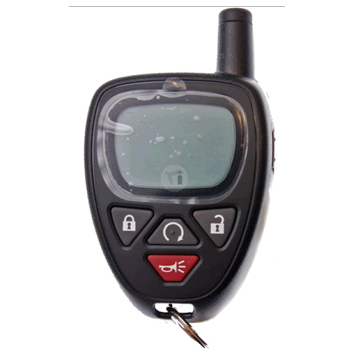 Once the response is received, the Vehicle Locator /Panic Alarm icon will flash for thirty seconds and the transmitter will beep twice. To turn the alarm off, simultaneously press the Right and Left side buttons or, press the Vehicle Locator/Panic Alarm button, if equipped. Press and hold the Trunk/Lift glass/Power Lift gate button for about one second to release the trunk lid. Once the response is received the display will show the Trunk/Power Lift gate icon and the transmitter will beep once. Press and hold the Trunk/Lift glass/Power Lift gate button or the Lift glass button for about one second to release the lift glass. Once the response is received, the display will show the Lift glass icon and the transmitter will beep once. Press and hold the Trunk/Lift glass/Power Lift gate button or the Power Lift gate button for about one second to open/close the power lift gate. Once the response is received, the transmitter will beep once and the Trunk/Power Lift gate icon will appear solid and then outlined. Pressing the button a second time while the lift gate is moving reverses the direction. Press and release the Right Side button twice within one second to enter the Enhanced Function Menu. The transmitter will beep once and send a request to the vehicle to refresh the data. While in the Enhanced Function Menu, you can scroll through the available features/functions (Radio, Odometer, Audible Feedback/ Silent Mode, Fuel Gage, and Tire Pressure, as equipped) by pressing the Right Side button. A box surrounds the active feature. Each button press will move the box to the right highlighting the next feature. Tailgating (requires radio to be on). There will be no visual confirmation of this command. While in the Enhanced Function Menu, press the Right Side button until the Vehicle Odometer icon is highlighted. The transmitter will then display the vehicle's odometer reading (whole numbers only). This will be accurate within 1 mile if you are within operating range of the vehicle. If outside operating range, Vehicle Odometer will display readings from the last successful response received from the vehicle. FUELGAGE: While in the Enhanced Function Menu, press the Right Side button until the Fuel Gage icon is highlighted The transmitter will then display the Fuel Level icon indicating approximately how much fuel you have left If you are within operating range and ignition is off Fuel Level will display the reading from the last time your Ignition was on. If outside operating range, Fuel Level will display reading from the last successful response received from the vehicle. If the fuel tank is low on fuel, and your vehicle's low fuel warning is being displayed, the Fuel Level icon will flash. While in the Enhanced Function Menu, press the Right Side button until the Tire Pressure icon is highlighted. The transmitter will automatically scroll through the four tires in a clock-wise fashion starting with the left front tire and show tire pressure readings in the lower right hand corner of the display. During the scrolling process the tire pressure readings can also be selected one at a time by pressing the Left Side button one time, the display will stop auto-scrolling and remain on a single tire until the Left Side out1on is pressed again, advancing to the next tire. The readings will be current if you are within operating range of the vehicle. If outside operating range, Tire Pressure will display readings from the last successful response received from the vehicle. The transmitter has the ability to operate a second vehicle equipped with a 2-Way Advanced Remote Start System. Press and release the Left Side button twice within one second. 2 (the 2nd Vehicle icon) will display and the transmitter will enter 2nd Vehicle Mode and beep three times. The transmitter will stay in this mode until the Left Side button is pressed and released twice within one second again. If there is no second vehicle matched to the transmitter, the 2nd Vehicle icon will slowly flash and a series of dashes will appear across the bottom of the display. The transmitter is only designed to control one vehicle at a time. 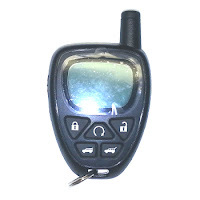 If you remote start one vehicle, and then enter 2nd Vehicle Mode, the transmitter will not accurately keep the countdown timer on the first vehicle. 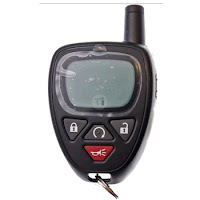 When the transmitter battery needs replacing, the "REPLACE BATTERY IN REMOTEKEY" or "KEYFOBBATTERYLOW" message will be displayed in the vehicle's DIC. Please perform the following steps. Note: In some instances you may experience a decrease in RKE range, however the transmitter battery may not need replacing, please refer to Explanation of Operating Range. Pry open the transmitter by inserting a flat object with a thin edge STarting at the notch located near the key ring opening. After separating the bottom half from the top half of the transmitter, remove the old battery by prying it upward. Snap in a new battery with the positive side of the battery facing down. Use a type CR2450 battery. Snap the front and the back of the transmitter together. Make sure the cover is on tightly, so water will not get in. Test the operation of the transmitter with the vehicle. If equipped, synchronize the transmitter's clock to the vehicle's clock. See "Clock Feature". Doesn't receive response from vehicle. May not be available on this vehicle; contact your dealer/retailer for addition information. Radio Next function not present. May not be available on this vehicle; contact your dealer/retailer for additional information. Tire Pressure function not present. See your vehicle's Owner's Manual for conditions that would prevent the remote vehicle start feature from operating. If you need to buy one of these remotes click here. Can't find a replacement case. Has anyone found one.